That's all it takes to make a muy delicioso smoothie, my friends. And apparently, all it takes to get me speaking Spanish. 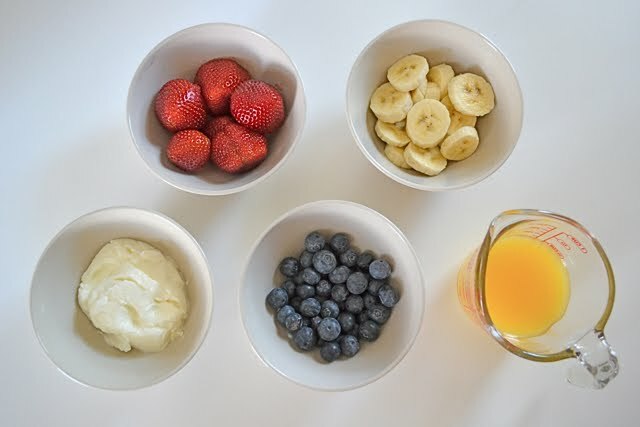 1/2 cup strawberries, 1/2 cup blueberries, 1 whole banana, 1/2 cup orange juice and 1/3 cup plain yogurt. Blend for 30 seconds and then proceed to watch your significant other tilt his head back and devour the entire glassful in 10 seconds flat. ummmm yum, delicious. this looks so pretty and good. perfect summertime treat! 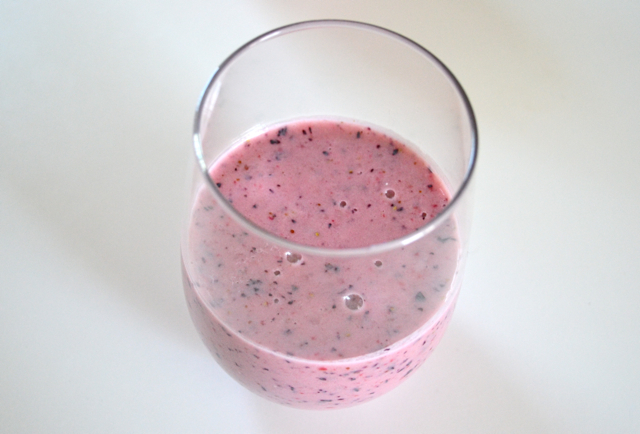 muy delicioso haha, gracias for the recipe, it looks very yummy...smoothies are a great way of packing the vitamins in! i am completely addicted to smoothies! i use all of these things, and often add spinach and almonds for a bit more of a healthy punch. yum!! crap. missing 2 out of 5 ingredients. blueberries need to make their way to india!!! Sounds (and looks) very good. Must try! Oh, yes please! This looks incredibly yummy (it doesn't help it's breakfast time here right now). Luckily for me, I brought my food processor on my road trip. (I'm crazy, I know.) Hope you're having a great weekend, Kayla!